Correct your Posture. Relieve your Pain. What if your Pain wasn't caused by your age, mattress, sport, job, genes, new/old sneakers, yard or house work? What if your posture is misaligned and wreaking havoc with your muscles and joints, causing your Pain? What if you knew what hundreds of thousands of others now know, that your misaligned posture & Pain isn't permanent. What if you could see what your posture REALLY looks like and could independently change it at home -- eliminating your own Pain? If you're looking for a solution to your PAIN that does not involve drugs, surgery or manipulation, you've come to the right place. There is nothing wrong with you. You're perfect. bearing weight equally side to side & front to back. It's time for your muscles & joints to relearn some things. Here is the original blue-print design of the human body. The body is balanced right to left, front to back and the primary load joints (ankle, knee, hip, shoulders) all stacked vertically under each other. The head sits level centered over the spine. All the joints are at right angles to the body. Just think about your car. Does your car have perfectly straight axles? Are the wheels fixed at right angles to the axle? What happens when the axle is bent? Are all the wheels still 90 degrees to the axle? Do the ball joints and tires and wheels receive exponentially greater pressures, uneven wear? What might mechanically fail or be compromised? "Most people assume that things like everted (duck) feet, rounded shoulders, one leg shorter than the other are nothing more than heredity or birth defects. All of these characteristics are SYMPTOMS." Pete Egoscue. Healing Through Motion. A lady with extremely poor posture. Would you agree? Changes in the shoulder, pelvis, ankle, knee position WILL lead to changing lengths and tension throughout the entire body. These changes will in time result in muscle & joint dysfunction and pain. Here are some examples of postures that compromise the body's original design and result in muscle and joint dysfunction and no doubt pain and problems. If there is knee or hip pain, the knee and hip are only trying to tell you they have lost their alignment and integrity that is why the cartilage is wearing down from uneven pressures inside the joints. Just look at the uneven pressures in the photo to the left. Good posture is the ability to maintain structural integrity of the joints. In the drawings to the left, the primary joints, ankles, knees, hips and shoulders, are not lined up vertically and horizontally. There are shoulder and hip elevations and rotations. There is valgus (knock knees) knee stress and varus (bow legs) knee stress, tibial torsion (low leg is torqued relative to the thigh/knee). Would these people experience pain? In time, no doubt because they have compromised the original structural design of the body. Your pain is the body's loudest signal that something is wrong and the underlying cause needs to be fixed. The symptom doesn't need fixing, the cause needs fixing and the symptom is seldom the cause. If you only focus on the symptoms, you'll never resolve the cause. The cause is your Posture Misalignment. Our Posture Alignment Therapy program follows the program created by Egoscue University and is designed to restore normal and pain free function to the body. The exercises and stretches are carefully selected to address each client's symmetry, balance and vertical load of the spine and load bearing joints designed to restore the correct amount of muscle balance and tension from side-to-side and front-to-back all under neutral postural alignment which vertically aligns all eight major load bearing joints. By re-training your body to hold it's original blue-print design and restoring normal weight bearing joint function you can give your body the opportunity to heal itself and get rid of pain naturally, without manipulation, medication, or surgery. SOME OF THE CHANGES YOU SEE ABOVE TOOK 2 HOURS. SOME TOOK 3 MONTHS OR LONGER. is the most efficient shock absorbing position to function with. When the body is restored to its original blue-print design (neutral anatomical position), the shoulders, hips, knees and ankles are directly aligned with one another, with the head and spine centered and the three natural S-shaped curves present within the spine. This anatomical neutral postural position is the most efficient and shock absorbing position for the body to function with. 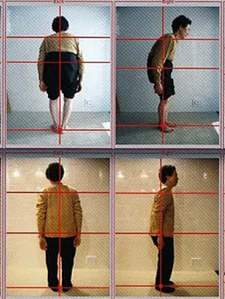 The body weight is evenly distributed throughout the spine and load bearing joints. This allows the body to easily and efficiently handle impact from the activities of daily living to imposed demands such as athletics. Restoring normal functional movement to the body is the key to eliminating pain and restoring health. Motion stimulates all of the body's systems (muscular, skeletal, nervous, circulatory, lymphatic and digestive). Motion is a signal to the body to restore, re-charge and renew itself from the inside out.